My kitchen and I have a standing appointment at 3:30 every day. Snack time. These days, snacks are the quickest way to my heart (blame the pregnancy), so I take snack time very seriously. Claire usually wakes up from her nap around then and joins me, and Fixer Upper is usually in the background because I have been inordinately interested in home repair shows considering I'm currently renting and can't even paint my own walls. These days, my favorite snacks are any fresh fruit or vegetable, trail mix, cottage cheese, or fancied up RITZ Fresh Stacks Original Crackers. I really love putting toppings on these yummy crackers. 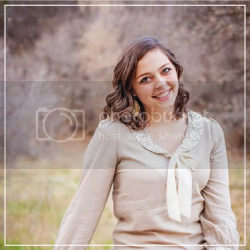 (Ahem, I may have blogged about this before, twice, here and here.) Here are my current favorite RITZ Fresh Stacks Original combinations. THE APPETIZER - This is my all-time favorite, and if I sign up to bring a finger food to a party, it's almost always this one. The combination of the fresh basil and the buttery cracker and the savory cream cheese...... Is it 3:30 yet? 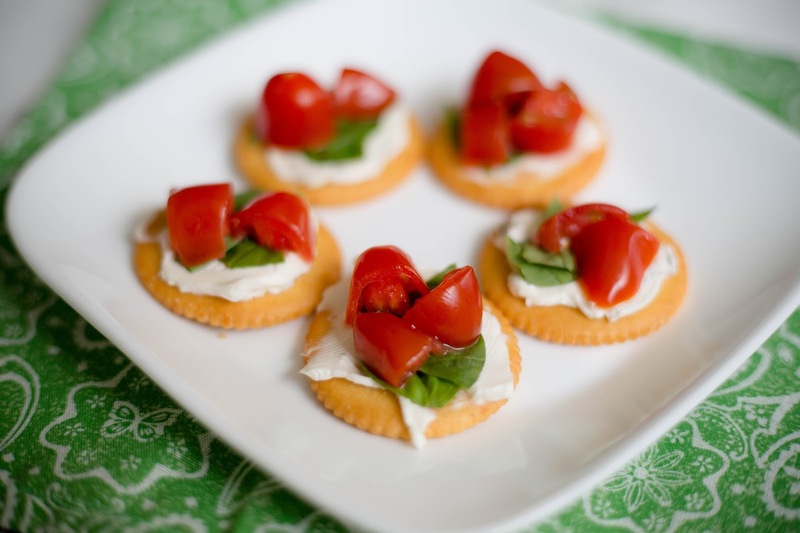 Ingredients: RITZ Fresh Stacks Original, chive and onion cream cheese, fresh basil leaves, quartered grape or cherry tomatoes. DECONSTRUCTED PB&J - I love this one, because it has all the protein and vitamins of a regular PB&J, but without the extra calories that come with two slices of bread. It's also easy, and we always have these ingredients on hand. 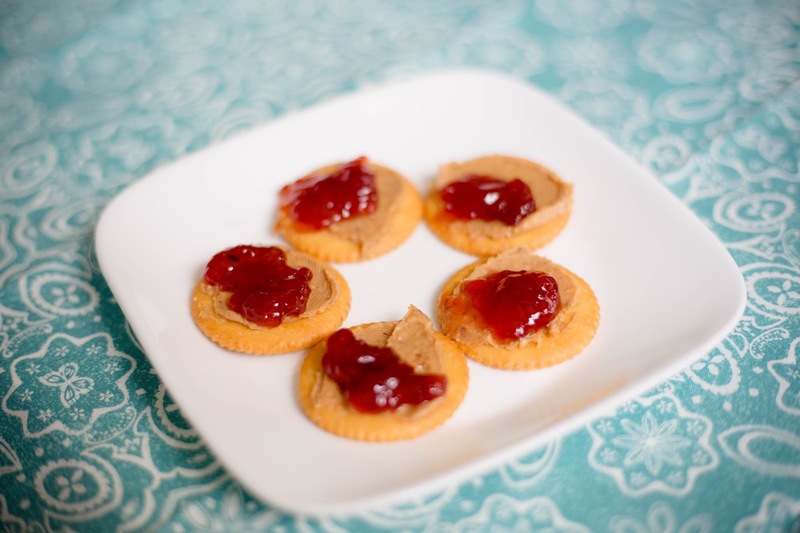 Ingredients: RITZ Fresh Stacks Original, your favorite peanut butter (we grabbed Peter Pan Simply Ground Peanut Butter), and your favorite jam or jelly. THE SWEET AND SAVORY - I discovered this combo at a live event at Walmart last weekend, and it is just so good. 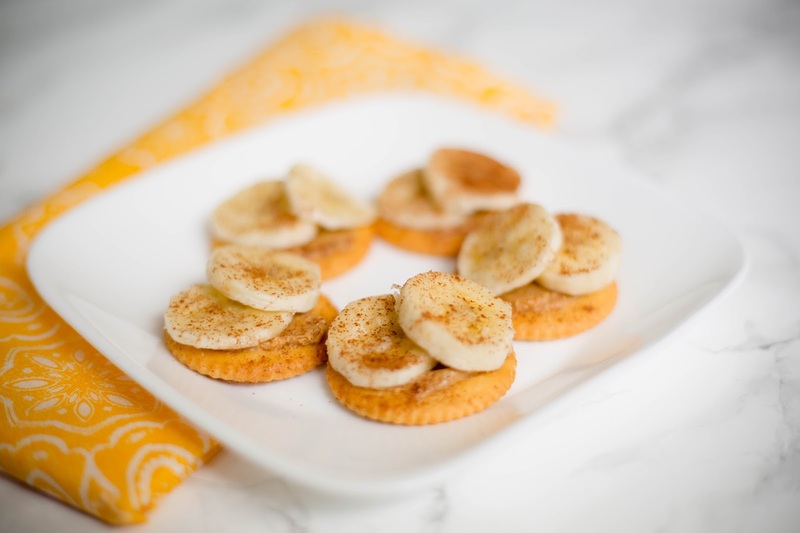 The RITZ Fresh Stacks Original and peanut butter provide the savory, the bananas bring the sweet, and the cinnamon provides the final touch. Ingredients: RITZ Fresh Stacks Original, peanut butter, thinly sliced bananas, sprinkle of cinnamon. Drizzle lightly with chocolate syrup for a true delicious sugar rush. 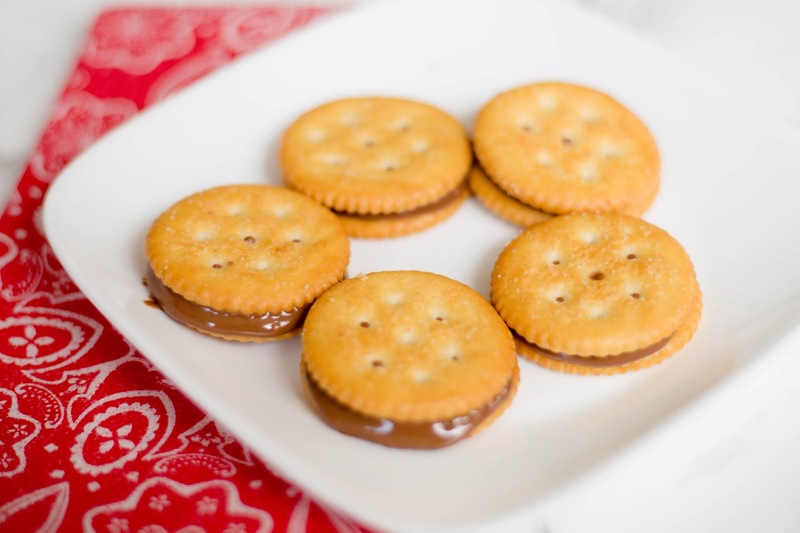 THE DESSERT - If you're my toddler, you'll peel the crackers apart and lick out the chocolate and caramel in the middle. If you're anyone else, you'll just take a bite (or eat the whole thing at once!) and enjoy the chocolate and caramel melting in your mouth. Directions: Place RITZ Fresh Stacks Originalon a baking tray, and put one unwrapped chocolate caramel candy in the middle of each. Heat in the oven for 5 minutes at 350. (I set them in the oven right when it starts preheating, and then take them out when I hear the beep that means the oven is done preheating.) 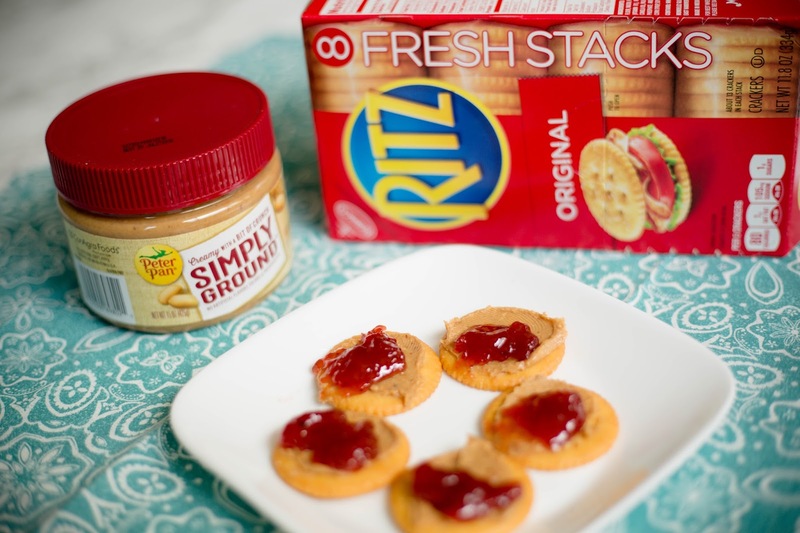 Immediately place a second RITZ Fresh Stacks Original on top. 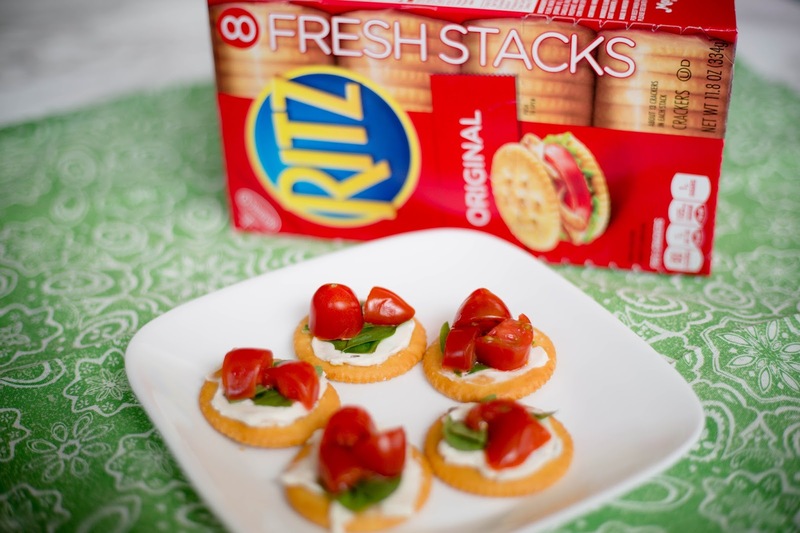 I saw a presentation in Walmart last weekend about these new RITZ Fresh Stacks Original packs. They crackers come in smaller sleeves, so you can open just one for snack time, or grab one when you're headed out the door for an on-the-go snack. RITZ Ultimate Butter Stacks are available for a limited time starting March 28! Adding any of these to your afternoon snack menu?